Over 120 Kindergarten to Grade 6 educators from the public school system have completed the GO Math Programme adopted in primary schools. The training session was organised to familiarise educators with the programme implemented during this school year (2018-2019). Global Solutions Specialist for Latin America, Canada and the Caribbean with Houghton Mifflin Harcourt (HMH) Company, Mr. Shatta Mejia was the facilitator. Mr. Mejia said the mathematics resources correlate with the National Standardised Mathematics Curriculum and supports best practices in teaching and learning. Mr. Mejia conducts training around the world including Asia, the Pacific and the Middle East and focused on areas such as material for differentiation, assessment and the 5E Instructional Model for Math and Science, which utilises the following processes: engage, explore, explain, elaborate and evaluate. The facilitator said the 5E Instructional Model transforms planning and teaching and develops mathematical understanding of students. Emphasis was also placed on student collaboration and active engagement in their learning. Based on the knowledge gained, educators have committed to make mathematics more interactive, student centered and to introduce the Math journals in the learning process. Director of Sales Caribbean and US Pacific Territories within HMH Company, Miss Lynn Guy; Education Officer for Mathematics, Ms. Germaine Scatliffe and Curriculum Director, who coordinated the event, Mrs. Prudence Mathavious were also present at the training. 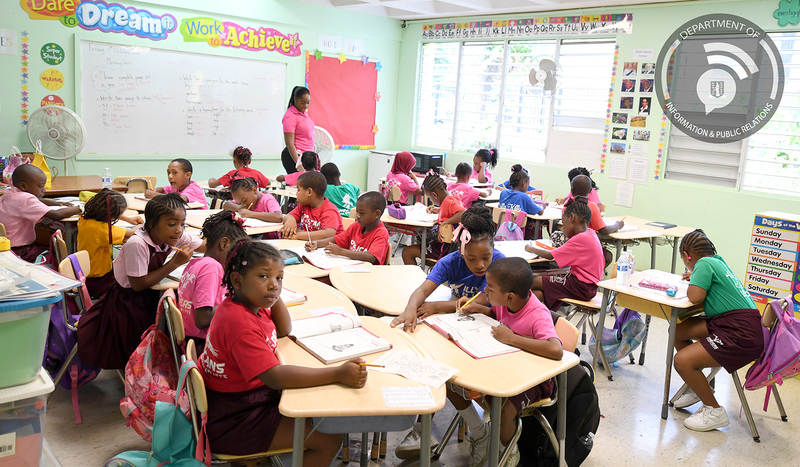 The GO Math Teacher resources used in the programme were funded by the Caribbean Development Bank Rehabilitation and Reconstruction Loan via a sales agreement with Island Services BVI Limited in the amount of ninety-nine thousand eight hundred ninety-four dollars and sixty cents ($99,894.60). For more information about projects funded by the Caribbean Development Bank visit bvi.gov.vg and follow the Government’s social media (Facebook, Twitter and Youtube) accounts: @BVIGovernment and Instagram @GISBVI and search for content using #CDBRRL. The Government of the Virgin Islands remains committed to the rebuilding the BVI stronger, smarter, greener and better. Photo Caption: Primary school teacher and students in a classroom environment.